Celtic punk crew Dropkick Murphys were forced to cancel a performance in Tulsa, OK, over the weekend after the band's tour bus hit and killed a pedestrian on a Texas highway. The band reported over Facebook yesterday (November 16) that following their performance in San Antonio, TX, the night before, they were making their way out towards Dallas to drop off vocalist Al Barr at the airport before the rest of the band went to Tulsa. According to the post, shortly after passing Austin, a "pedestrian suddenly ran onto the highway in front of our tour bus." The as-yet-unidentified man was killed, with police suspecting a suicide. Round Rock, TX police department spokesperson Angelique Myers confirmed with the Boston Globe that they had been alerted to the accident around 3 a.m. local time. The group added on their end that no one onboard was seriously injured, though the tour bus was in a state of disrepair. "We were left with a driver that has been severely shaken up by the accident and a bus too damaged to continue onto Tulsa," the Dropkick Murphys wrote, confirming they had cancelled the Sunday night performance at Cain's Ballroom. "Throughout the early morning hours we tried every possible way to get our band and gear to Tulsa but we've simply run out of time. "As much as it pains us to miss a show and we truly apologize for it, we'd like to stop and acknowledge that a man has lost his life. Please keep him and any family he might have in your prayers." 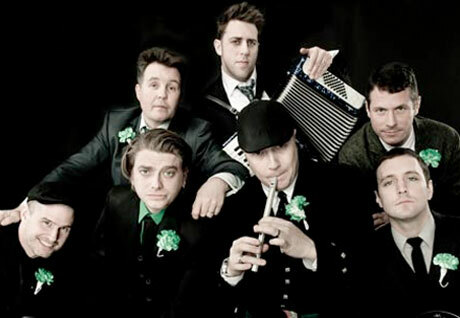 You can see all Dropkick Murphys' upcoming tour dates here.